I’ve been thinking for the past few weeks as I put together my pictures for my Country Kids post that they are mainly of Andrew, with the odd one or two of Joel. This particularly hit home to me when Fiona (who hosts the linky over at the Coombe Mill blog) commented last week that it was nice to see a picture of Joel and me – I’d given my phone to Tom for a couple of minutes and he took one of the two of us. The reason I rarely get photos of Joel when we’re out and about is that I’m always wearing him in our wrap, so he is right next to me and it’s pretty difficult to get good pictures like that – I’m not very good at holding the camera at arms length and getting a good shot of myself. When I was pregnant with Joel, knowing there would only be 21 months between Andrew and the baby, I wasn’t sure whether to get a double buggy (I blogged quite a bit about my thoughts back then) because they all seemed too big for our small flat, amongst other reasons. 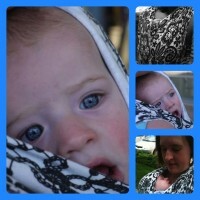 In the end I decided to buy a good sling and wear Joel in that whilst pushing the single buggy with Andrew in. 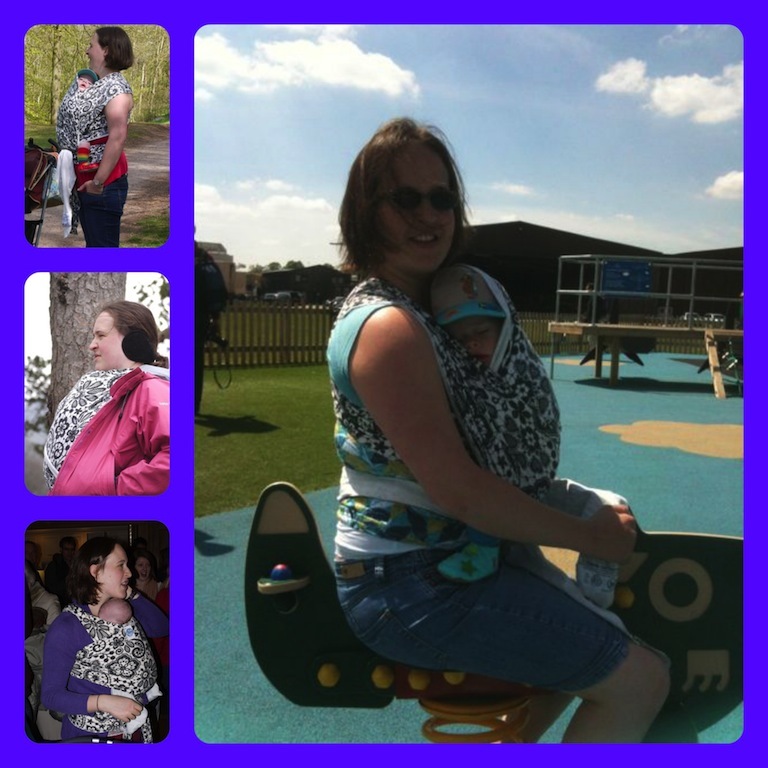 And this has worked very well, even up to 7 months, and we’re still going strong, although I will need to switch to another style of sling or our framed back carrier fairly soon as he’s starting to outgrow the stretchy wrap. I decided to buy a stretchy wrap because I’d heard that they are very comfortable, and I loved the idea of wrapping my baby snuggly next to me. I went for the Moby stretchy wrap in this lovely lace design, because I felt like it was another layer of my clothing which I would be wearing a lot and therefore it was worth getting something pretty that would look nice with my other clothes. I did consult Tom, because I wanted him to feel confident in wearing the baby in the wrap occasionally, and he said he wasn’t bothered what colour or pattern it was. He has generally concentrated on looking after Andrew whenever we’re together as a family, but he has been kind and taken Joel sometimes when I’ve been too tired, needed a bit of a break, or wanted to spend time just with Andrew. So whenever we are out and about, Joel mostly comes with me in the wrap. I love it because I have my hands free to play with Andrew, and it’s so comfortable that I can wear him for hours and not get any aches or discomfort. We do a lot of walking in our everyday lives in Cambridge, and it’s so easy to wear Joel for it all. He loves it because he can see what’s going on easily as he’s at a good height to survey the scene, and it’s also the only place he will reliably fall asleep with no fuss during the day when we’re out and about. As well as out and about close to home, I’ve also worn him comfortably on holiday in the Lake District and on day trips such as those I’ve written about in previous Country Kids posts. The rain cover that I bought has been essential, and is a simple but ingenious solution to wearing a baby in wet and windy weather. Not that he’s ever cold in it, in fact we do get quite warm the two of us next to each other, so I find I have to adjust our layers accordingly when going out with the wrap. I recently came across and bought a cheap tandem (inline double) stroller that umbrella folds like the classic Maclaren stroller, which I hadn’t seen when pregnant, and this fits easily into our flat. There are some occasions when I prefer to take the double buggy: I realised that Joel was spending less time on playground equipment at the park than Andrew had been at his age, because whenever we went Joel was wrapped up and often asleep, so there was no way I’d go through the palaver of getting him out, so if he’s in the buggy, it’s easier to get him out and in again; as it gets warmer, I’m aware that we’re both getting very hot next to each other, and when I’m pushing the buggy too, I can work up quite a sweat, so I feel less comfortable wearing him if I know I’ll get sweaty and have to sit at a group for a while. It’s all about having options – there are three different ones that I have for getting out and about on my own with the boys. The wrap and single buggy is one, the double buggy is another, and the single buggy plus buggy board is another (which I use when we’re not walking too far). It’s nice to have so many options – not that I did when I had the triplets! They grow so quick I don’t blame you for wanting to keep Joel close – enjoy it while it lasts. That is a gorgeous little video of happy smiley Joel obviously enjoying being wrapped with Daddy. Thanks for coming over and sharing with Country Kids. Yes having triplets it must have been a military operation to get out the house in any form of transport! I have respect for anyone with more than 2 children 🙂 I know, /i can’t believe he’s 7 months already! Thanks for taking time to comment on my post and all the others.